Is the new Banana Rock slot machine going to rock your world? Or will your casino balance be slipping and sliding around? 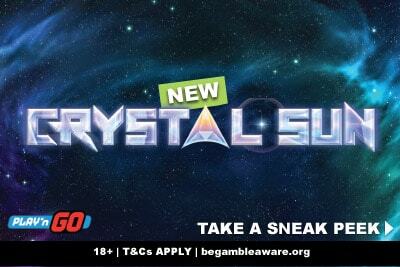 Find out what to expect of this brand new Play'n GO slot come 27th November 2018. 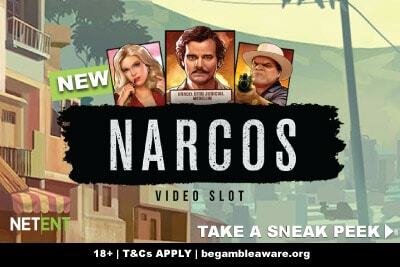 We get very excited when Play’n GO announce a new casino game because they rarely let us down. Granted, this year has seen a couple of so-so slot games; the Cats and Cash machine was fairly generic and their latest Iron Girl was a little divisive. 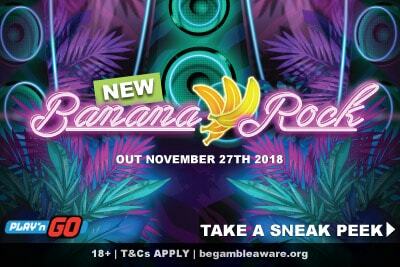 But this new Banana Rock slot machine is certainly unusual enough that we want to take a closer look at the information we’ve been given prior to its release. Will this be totally bananas… but in a good way? We know enough to be intrigued, and whilst we don’t have a video, we do have plenty of screenshots to give you a feel for the game. What is this monkey madness? Well according to Play’n GO, Banana Rock are a jungle band, playing in a neon forest to an invisible audience. Because it turns out, LSD isn’t frowned upon when you are creating video slot game themes. Yes, it sounds a little crazy, but no crazier than having little exploding Alien heads in Reactoonz or pool diving bovine in their Crazy Cows slot. At least it’s not boring, and looking at the screenshots, beautifully rendered. Whatever Coolade they’ve been drinking over at the Play’n GO office, we are well and truly on board and will happily bring our own mugs to the party. But, if we are going to have a look at whether this game is worth playing, we need to look at more than just it’s pretty graphics. Intrigued? So are we, especially about this Encore Spin at the end of the bonus free spins – that’s some potentially big multipliers available. The fact that you are guaranteed a win is also unusual because if there’s one thing about gambling that we’re used to it’s that there are never any guarantees. There’s a whole load here to unwrap. Let’s take a closer look at some of these features. How do you play and win on the Banana Rock slot? Thankfully the betting range is going to be large enough here that almost anyone will be able to press the spin button. The fact that Banana Rock has 10 fixed paylines makes it even easier in that you don’t need to worry about figuring out a million ways to win. In short, it sounds like a perfect beginners slot, right? Well… you’re not wrong, but you’re also not right. You probably skipped over the part that read that this is a more volatile slot than some. That said, considering some of their past online slots have been TRULY volatile, ie. so much so it can be a little frustrating (looking at you Sizzling Spins slot), this one may not be so bad after all. Looking at how this mobile slot is set up, it’s obvious that the bigger win of the games will be in the free spins. If they can afford to give you 10x to 20x multipliers on that final Encore Spin with high paying symbol, it means that base game wins probably won’t be out of this world. But the wild symbol gives us hope that just because the big wins are in the Banana Rock bonus games, doesn’t mean that the base game will be boring. That would be because of those joining wilds; that’s when there are two wilds on screen, and then one marches towards the other, leaving behind a wake of more wilds. It’s not new, but it’s not a slot feature you see often. The two that come to mind are Wild Toro by Elk Studios and Reel Heist by Red Tiger Gaming. You just need to catch two scatters, one on reel 1 and the other on reel 5. That will give you 10 free spins to get as many stacked symbols as possible. Basically, each reel is ‘owned’ by one of the band members. If they land fully stacked on that reel, they increase the multiplier for that symbol, so suddenly it’s worth 2x, 3x, 4x or 5x their paytable value. 10 free spins aren’t much to get many of those multipliers, but the good news is that a single scatter will give you extra free spins. 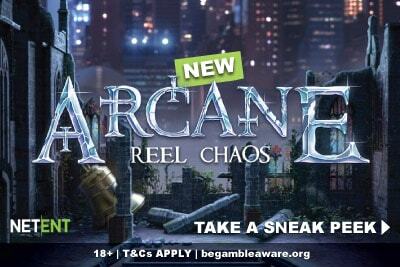 If this works anywhere like in their Grim Muerto slot, expect to play a whole load more than just 10 spins. This will serve you well for that final Encore free spin. This is both what makes us truly excited, but also a little scared. Namely, because you are trying so hard to get specific stacks of monkeys during the free spins, we don’t see the wins coming that fast and loose during the bonus game. So this last final spin is probably going to be your final chance to catch a big win. Being as this is a volatile slot, expect some tears a lot of the time. That said, the fact that they guarantee you a win with one of the high paying symbols puts our mind at ease a little bit. It means that you won’t walk away empty handed. Of course, the 27th of November 2018 is still a way away, so meanwhile, why not play on their latest Dragon Maiden slot which has some interesting and unusual mechanics of its own? The best place to find this casino slot is at the always brilliant Vera and John casino, who always give players the best experience and plenty of reasons to keep coming back for more.